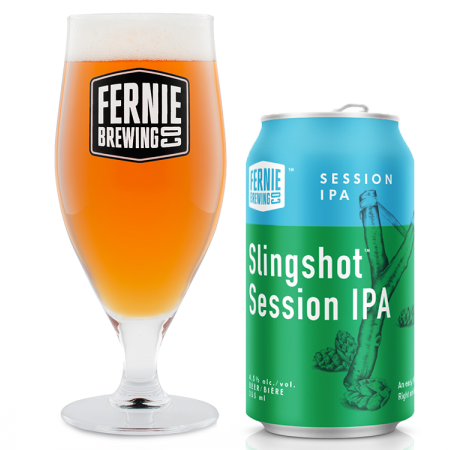 FERNIE, BC – Fernie Brewing has announced the release of an addition to its core brand line-up, as well as the launch of two mixed packs – one a new year-round package, and the other the latest edition of an annual seasonal sampler. Regular IPA imbibers will not be disappointed with our selection of traditional and some of the newest hop varieties available, including Australian Galaxy and North American Citra and Mosaic varieties, providing a citrusy, tropical fruit and some pine flavours and aromas, and resulting in a refreshing and easy drinking Session IPA. In addition to being available on its own, Slingshot also appears in the Hop Trick Mixer Sixer, a new sampler pack featuring two cans each of Lone Wolf IPA, The Griz Pale Ale and Slingshot. Also out now in the 2015 edition of the Summer Craft Collection, a 12-pack that includes three cans each of Project 9 Pilsner, Big Caboose Red Ale, The Griz Pale Ale and Lone Wolf IPA. All three releases are available throughout BC and Alberta, and the Summer Craft Collection can also be found in Manitoba.